"I told you when we first started working together that my first benchmark for comparison would be the Red Top Rumble. This morning my goal was to run it your way - level head, easy arm swing, pull from the hips. Today's time was 5 minutes faster than my times the previous two years. Five minutes faster!! Are you kidding me? And, I never felt like I was racing. I had plenty of gas left in the tank." 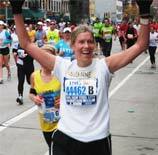 "I just ran the Albany marathon yesterday and it went really well. It was so much better than all of my past races. The last 8 miles did not hurt, which was amazing! Instead of going into my typical survival mode and just shuffling along, I just relaxed and kept thinking about what you said." "I've got to tell you the changes you've made to my running form are fantastic. Our work to change my posture and get my feet more underneath me has been making an unbelievable difference. My legs no longer kill me after running four miles. That right there makes you worth your weight in gold!" "We both finished Avenue of the Giants. It's the first marathon we've been able to train for and finish in a couple of years, so we are both excited. I ran my fastest time in about 10 years and qualified for Boston again. Marty got a little too excited with his pace, but still PR'd. We can't wait to work on more of our issues." "I just wanted to drop you a quick note to thank you for all of your recommendations and guidance in preparing for the NYC marathon. I couldn't have done it without your help. It was such a terrific experience! I look forward to continue to improve on my marathon and half marathon times!"